Whilst I understand they’re in the process of developing some other flavours too, they’ve started with two best sellers and a brand new flavour (yep, you read that right), which are all almond milk based and vegan certified. CHOCOLATE FUDGE BROWNIE – rich and decadent, with possibly the most chocolatey ice cream I’ve ever tried in my life. Amongst the ice cream are chunks of soft, fresh tasting fudge brownie* – which surprised me as I thought being frozen amongst ice cream would mean it was chewier but this wasn’t the case – I couldn’t have been more wrong. I think this flavour tasted even better than I remember the “original” flavour with cow’s milk to taste. *The fudge brownies come all the way from New York’s Greyston Bakery since 1988. At Greyston Bakery the baking is all part of a greater-good mission to help provide jobs & training to low-income city residents. If someone is looking for a job they put their name on the list, when it gets to their name, they are offered the job and trained up – simple as that. They “don’t employ people to bake brownies, they bake brownies to employ people…” – love this so much. More info about the bakery here! PEANUT BUTTER & COOKIE – although I like peanut butter, I’m not usually a fan of peanut butter ‘flavoured’ things, but I wasn’t about to pass up on the opportunity to try this exclusively non-dairy flavour, so I had a little bit for good measure… And I am so glad I did because it was delicious. The crunchy peanut butter swirls amongst the vanilla ice cream with the cookies was really good. Wonderfully peanutty (just made that word up) and just the right amount of crunch from the cookies. For the purpose of the event they also did a fourth serving which was the Peanut Butter & Cookie flavour sandwiched between two pieces of peanut butter cookie. It was tasty but oh so rich, one bite and I had enough sugar to last me the rest of the week. If I’m being completely honestly I do not think I would be able to tell the difference between the dairy and non-dairy options. The flavours were perfectly indulgent, the ice cream was creamy and the pieces of typically non-dairy foods (cookies/brownie) tasted true to memory, no funny after tastes or consistencies. I was also pleased to find out the flavours are the first ever non-dairy Fairtrade-certified ice creams in the UK! 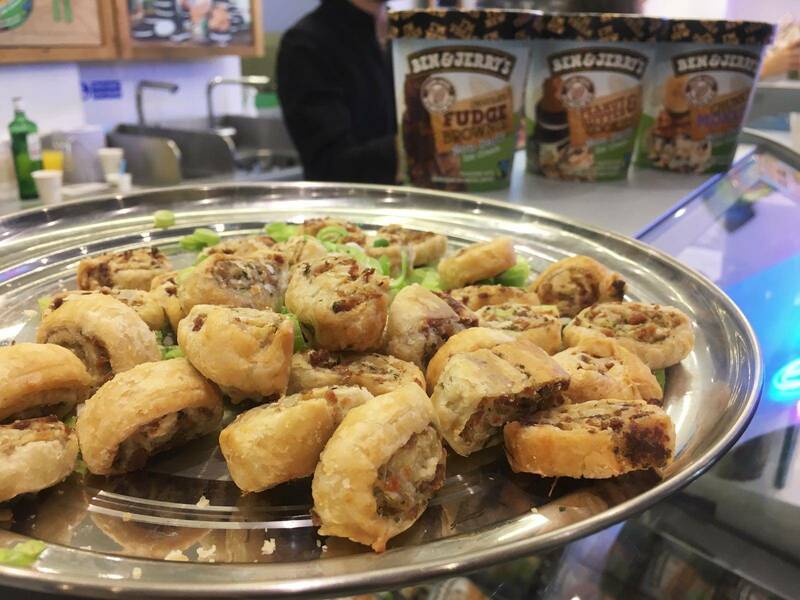 Not only do they taste good, they do good too – fully on board with that! 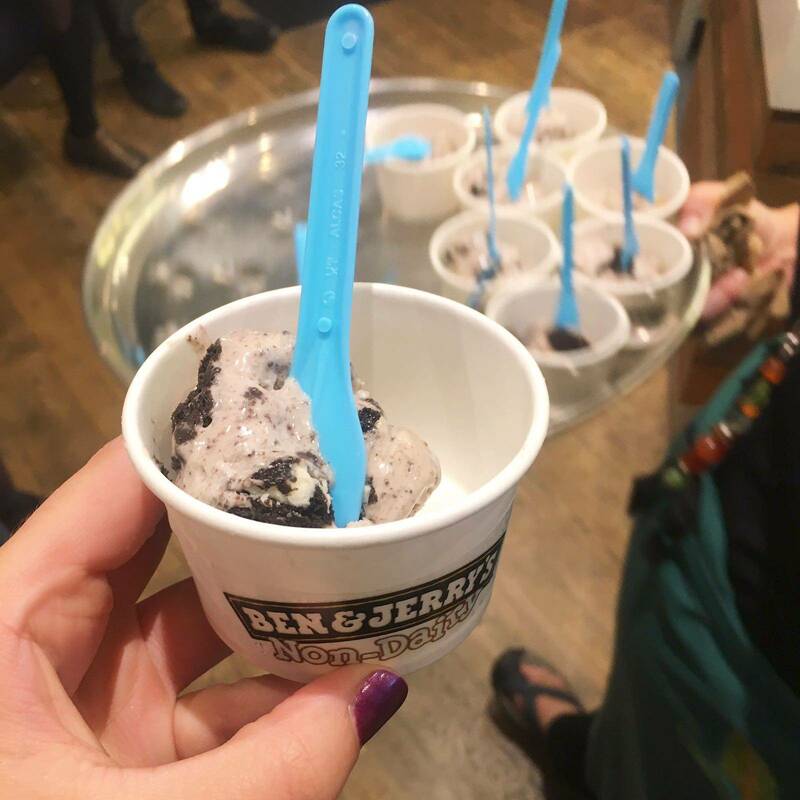 A couple of weeks ago I received the invite to this “top secret” tasting event at the Ben & Jerry’s shop on Wardour Street. The fact there was even in a shop in Soho was news to me as it’s opened fairly recently, and after checking that the event was in fact vegan friendly I kept the secret, not telling a soul until yesterday rolled around and news of the Non-Dairy ice cream had been released to the world and was all over the internet! 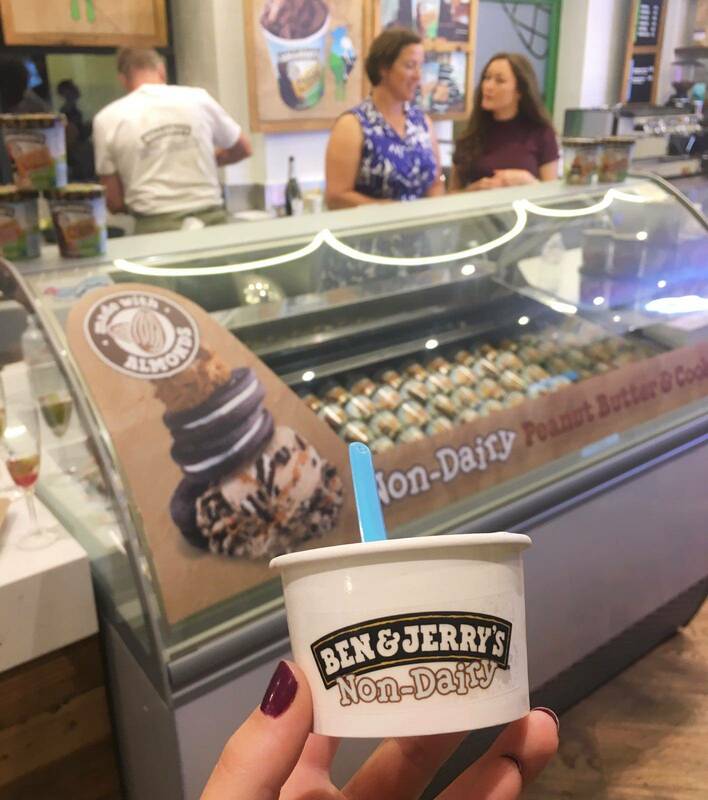 Turns out the event I was invited to was actually *the* UK launch of the Non-Dairy ice cream – best event invite ever!! On arrival we were handed either a pomegranate fizz, mimosa or non-alcoholic cocktail before having a mingle and enjoying some savoury nibbles and canapes from Change Kitchen catering, which was all wonderfully delicious. 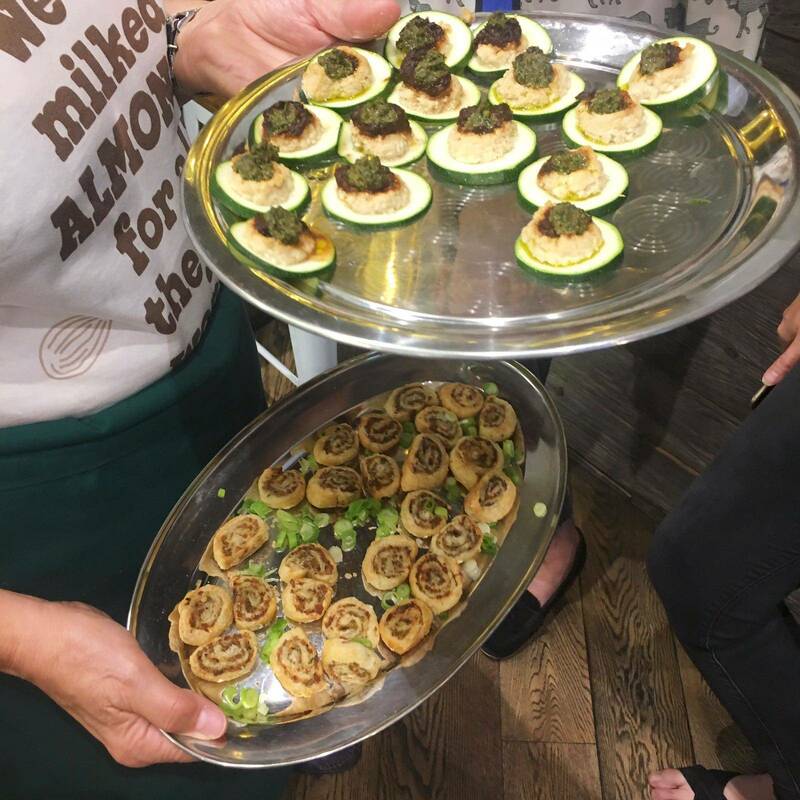 They provided mini vegan sausage rolls, raw lasagne bites (courgette slices with cashew cheese, sundried tomato tapenade and wild garlic pesto), and arancini balls (Butternut Squash or Mushroom), as well as some dips! 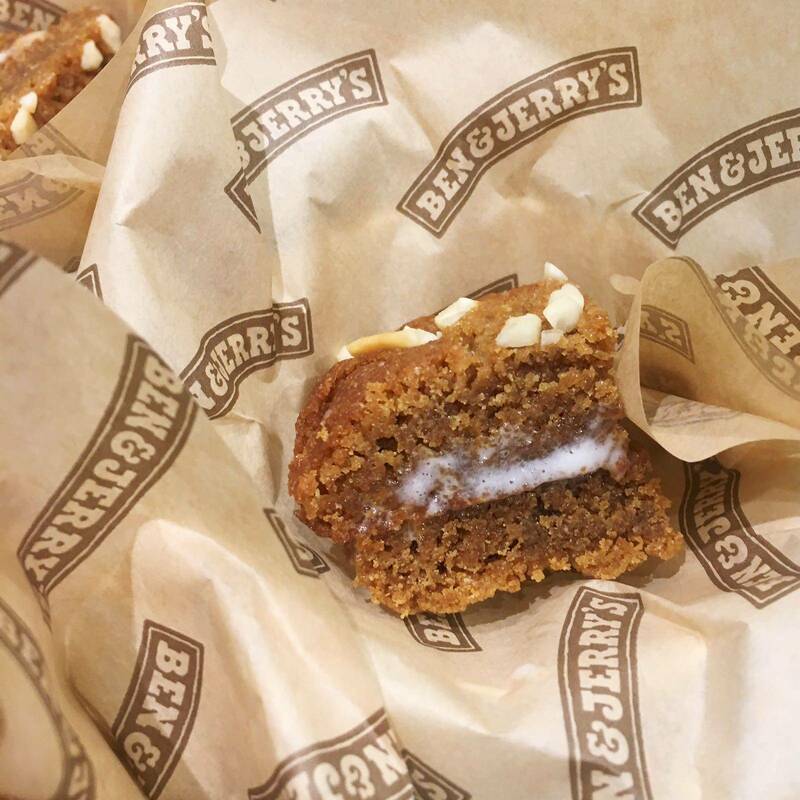 We were introduced to the ice creams by Ben & Jerry’s Flavour Guru (best job title ever? ), Andrea Ball. 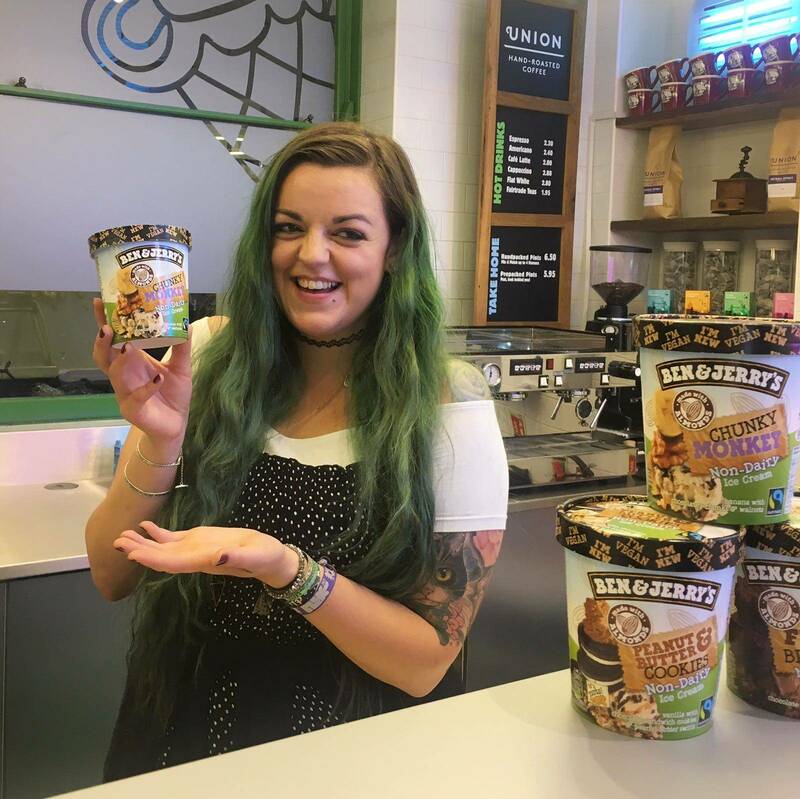 She told us that before they even got started on the specific flavours, the company made 50 batches of simply ice cream to ensure the flavour and consistency were just right before getting all fancy with the additional chunks and swirls. Also welcoming us to the event was Serena Lee from Vegans of LDN (which is a fab blog & instagram, that you must check it out). Before we left we were given a Ben & Jerry’s tote bag containing a selection of goodies, including: vouchers to get a tub (or 3) of the non-dairy ice cream, a t-shirt with the slogan “we’ve milked almonds for all their worth” and a vegan peanut butter cookie (I can’t remember where this is from at the moment but will update my blog once I check)! 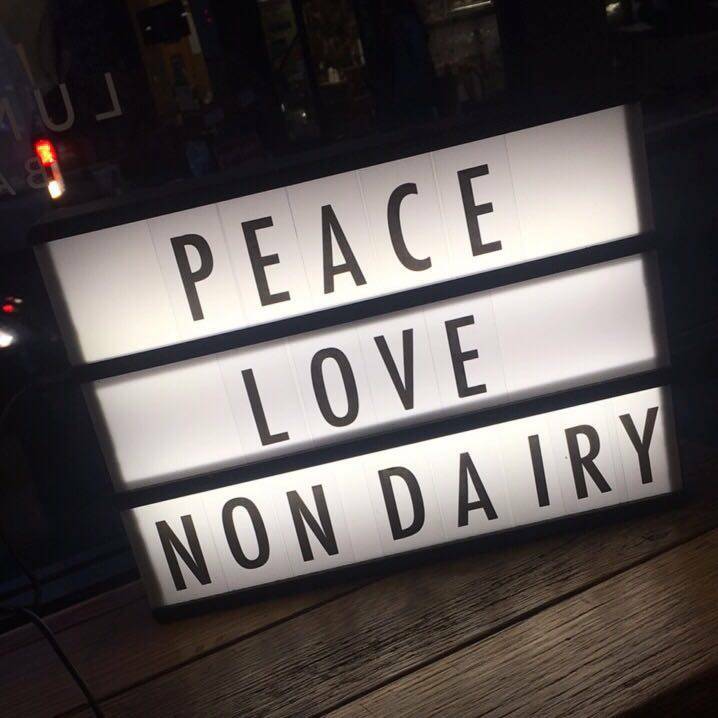 Overall it was a such a lovely event and it was so great to finally meet fellow vegans who I’ve known of online: Serena (Vegans of LDN), Romy (Romy London UK), Jennie (The Nutty Noodle) and Nat (Tea and Cake), as well as some members of the Ben & Jerry’s and W Communications teams. 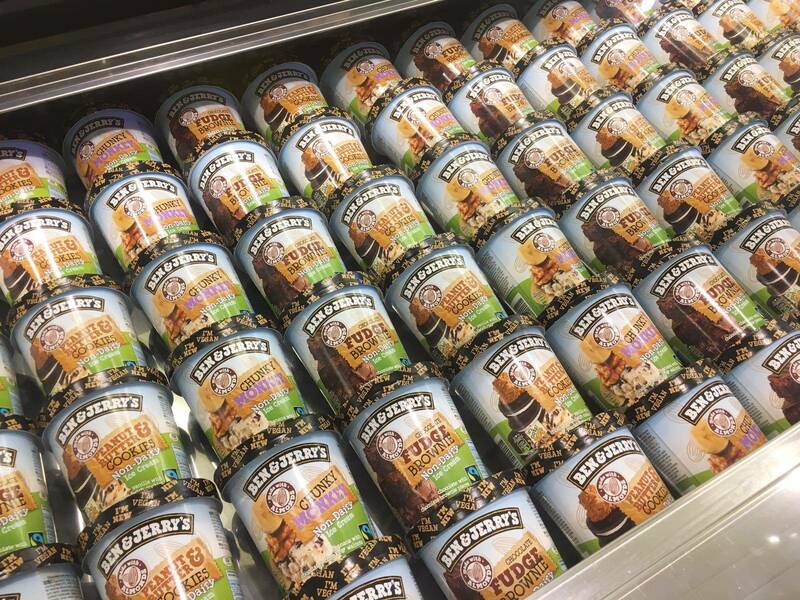 Was the Vegan Ben & Jerry’s Ice Cream worth the wait? I cannot wait to try these! They’ve been out in Finland & Sweden for a month or so and I though I’d get to try them at the end of them month when I am over – but looks like I might even be able to get my hands into some before I travel. Interesting to see how they will compare with the Oatly ice creams…those, mind, are more like the Swedish Glace kind, just of flavour and not as decadent and Ben & Jerry’s. Congrats on getting an invite! I didn’t realise they were out in Finland & Sweden! That’s awesome. Hope you manage to get your hands on some very soon to try the flavours. They’re sweeter than the Oatly/Swedish Glace ice creams I think, plus a little different too with the slightly more unusual flavours. Let me know what you think! Are they selling the vegan ice cream to the public at that Wardour Street shop already? I’m not 100% sure on this, I think they are, but I’m going to double check for you! Ahh this is so exciting! 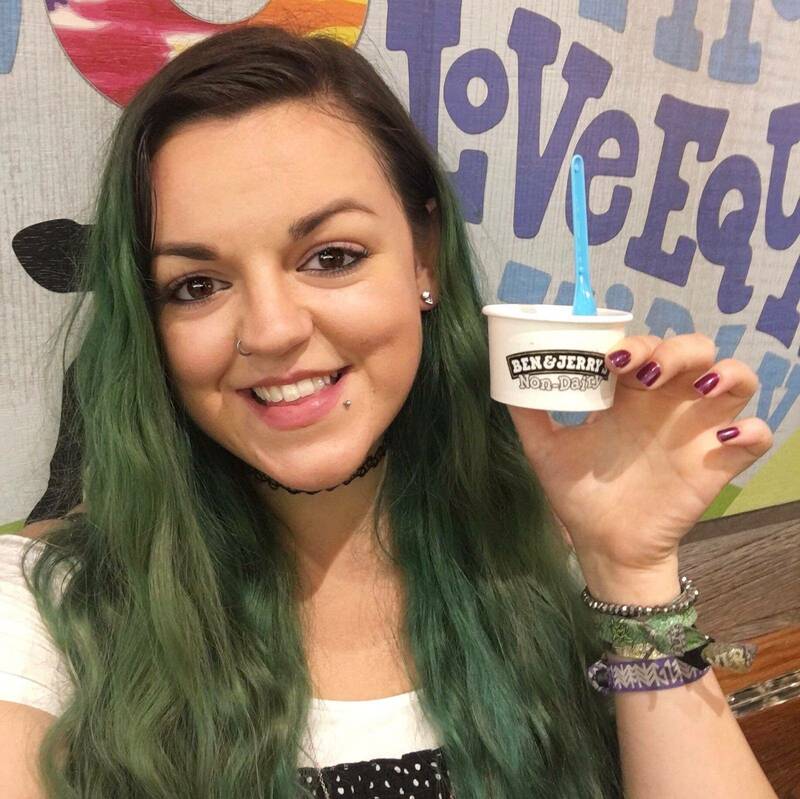 Before I went vegan I loved Ben and Jerrys and have been on a constant lookout for a pint – still haven’t managed to find any in my local supermarket but when I do, my life will be complete. All the flavours sound absolutely incredible. Thanks for sharing this dear! Awh bless you, no worries for sharing, glad you found it useful – it is SO exciting isn’t it! I hope you manage to find some in the shops soon, it’s seriously delicious.